Product information "Saves Nails Instant Grab Adhesive"
Alternative to mechanical fixings - no more nails! Fast bonding, non-slumping, multi-purpose adhesive for interior and exterior use on wood, masonry and metals. * Depending on bead thickness and temperature. Not suitable for areas subject to frequent water immersion. Not recommended for use on asphalt, bitumen or polystyrene. Not to be used as a mirror adhesive. Dusty or porous surfaces should be primed. 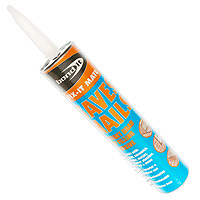 Related links to "Saves Nails Instant Grab Adhesive"
Customer review for "Saves Nails Instant Grab Adhesive"